Chemical Constituents and Components : Main chemical components are abrin, abraline, choline, trigonelline, gallic acids, precatorine, abricin, abridin, abrectorin and several amino acids. Alkaloids: 1. It plays important role in nonspecific immunostimulant. 2. It possesses antibacterial activity against gram positive and gram negative bacteria. 3. It causes the release of adrenaline from the adrenal glands and effects central nervous system. 4. It acts directly as thermogenesis in the human body and helps in reducing weight. 5. It raises the blood pressure and indirectly acts on sympathetic nerves. 6. It dilates the bronchioles in the lung by stimulating beta andrenergic receptors, thus helpful in asthma. Curing Diseases : 1. The seeds are used for homicidal purposes and as abortifacient. 2. 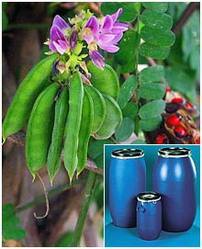 It is used for curing skin diseases, wounds, alopecia, asthma and treatment of ulcers. 3. It is used externally in treatment of nervous systems, diarrhea, and dysentery and possesses anthelmintic properties. 4. Roots are used for treating sexually transmitted diseases like gonorrhea, syphilitic disorder. 5. It is also used against jaundice and haemoglobinuric bile.